Guest: Tricia Meteer of Equinox Photo told us all about Cowgirls for a Cause and where they are hoping to go with it. Also, check out her book called Building Bridges. Guest: Wanda Goldberg is the host of the popular Animal Planet Show Faithful Friends. 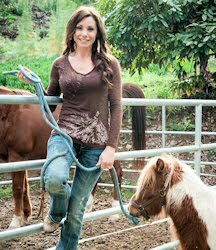 She is also an ex-Hollywood stunt woman and a farrier.